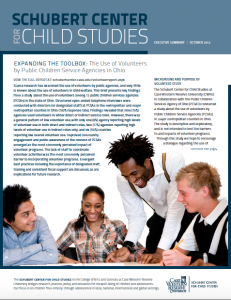 The Schubert Center in collaboration with the Public Children Services Agency of Ohio (PCSAO) conducted a study about the use of volunteers by Public Children Service Agencies (PCSAs) in major metropolitan counties in Ohio. Schubert Center Research Associate Julia Kobulsky was responsible for conducting much of the original research. Through this study we hope to encourage a dialogue regarding the use of volunteers by PCSAs and provide examples of successful volunteer programs for county PCSAs interested in expanding their volunteer utilization. Improved community engagement and public awareness of the mission of PCSAs emerged as the most commonly perceived impact of volunteer programs. The lack of staff to coordinate volunteer activities was the most commonly perceived barrier to incorporating volunteer programs. Emergent best practices including the importance of designated staff, training and consistent fiscal support are discussed, as are implications for future research.